If you’re thinking about remodelling your bathroom, the possibilities seem like they are endless. With so many different bathroom styles floating around choosing the right ideas that reflect the functionality you need and your own personal design taste early on is very important as you will likely have to live with those decisions for years. Here are 3 tips for your next bathroom remodel. The surfaces such as walls, countertops, floors etc are not solely about looks. They actually play a much larger role as your choice of surfaces will affect how much time and money will go into maintenance once the project is complete. A wooden floor in the bathroom might have the aesthetic that you are going for, but will be a nightmare to keep looking well as it’s not a suitable material to deal with daily water spillages. Similarly, you should consider quartz countertops over marble and glass shower doors that have been treated with anti-water spotting agents. 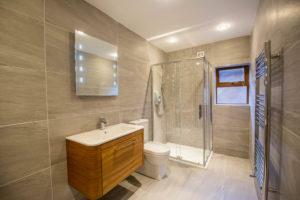 One of the best ways to show off your bathroom remodelling project is with plenty of light. Bright open spaces are nice to be in, but it will also make the room look larger and showcase your investment. If your bathroom does not already have good lighting, you should consider adding extra windows or skylights to make the most of the available natural light. If that’s not an option then make sure you choose reflective finishes that are light in colour and add more lighting fixtures around your bathroom wherever they are necessary. With uncertainty constantly surrounding how the government will handle water bills in the future and in advances in technology, there’s never been a better time to remodel your bathroom with energy and water efficiency in mind. Consider using LED lighting solutions in your new fixtures and even tankless water heaters to save on electricity, well-insulated windows to save on heating costs and to save water you can install low flow toilets, low flow taps. You can discuss your options with your designer/builder to see what will work best for your space. When carrying out your next bathroom remodelling project make sure you choose the right surfaces that don’t compromise on looks or functionality, take lighting into account to make your bathroom look it’s best and plan for an energy and water efficient bathroom that saves you money long-term. Start planning your bathroom remodel with Sigma Homes today, call us on 021-436-5866 or visit us online to book a consultation.